In the original biblical texts, the term used for disciple refers to someone who is a learner or follower who serves as an apprentice under the tutelage of a master. The apostles are great examples of this relationship between a student and master: They followed Jesus the Lord, the master teacher and the model of Christian faith, learning from His words and deeds and growing through the practical, hands on training He facilitated. To grow in our knowledge and love of God is one of the promises we make as Christians at our baptism. Unless we grow, we die. Growth is necessary in our relationship with Jesus Christ. It is my conviction that in order to be faithful stewards of our Christian heritage, we must continue to learn more about our faith and how to apply it in our everyday lives. Christian Education must not stop with the end of Confirmation classes. This adult Christian education program has been designed with the unique needs of our congregation in mind and it is hoped that everyone will find a class that will support their Christian growth. Finally, do you know a profession that does not require continuing education? I suggest we see ourselves as professional Christians and I invite you, through education, to stay on the cutting edge of faith for yourself, your family, your neighbors, our faith community and the world. We are truly blessed to have a labyrinth here at Prince of Peace. It is an eight-circuit outdoor labyrinth patterned after the one built in Cathedral of Chartres, France in the 12th century. This Eagle Scout Badge project by one of our troops members, was dedicated in September 2006. 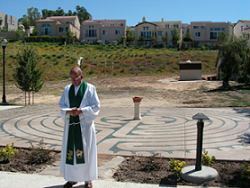 The labyrinth is built as a sacred space, to worship and pray, to walk it like a pilgrimage to Jerusalem. The Labyrinth is a safe place. Basically no rules apply to walking it. You can go in at any place and leave at any place in the Labyrinth. Setting a pace is important until you get to the center, as other people maybe on the same journey. Walk around them if need be. But reflecting and meditating is one key, and what may not be apparent today may show up at a later time. The Labyrinth here at Prince of Peace is open everyday to the public. So reflect and enjoy. Prayer is important to our wellbeing. The Internet Intercessor Prayer ministry is a group of parishoners who stay "on call" via email and social media to provide prayer support for those who need prayers "right now". The Intercessors belong to the Prince of Peace Internet Intercessors Yahoo Group Site. When there is a prayer need it is posted on the Group Site by either the members themselves or via a liaison to the group. Each Intercessor is then informed directly through email of the prayer need. The Intercessors with the help of the Holy Spirit prays for the needs of the individual. We will make sure that your prayer request is posted on the Intercessors Group Site. In The Purpose Driven Life, Rick Warren writes, "God intends for us to experience life together. The Bible calls this fellowship ... real fellowship is so much more than just showing up at services ... It includes unselfish loving, honest sharing, practical serving, sacrificial giving, sympathetic comforting, and all the other 'one another' commands found in the New Testament." Acts 2 church, where people gathered together in the temple but also met in homes. We are committed to having everyone in this Parish connected in a Life Group. Small groups occur periodically as seasonal studies, Alpha courses, and as part of Adult Christian Education. Sometimes a small group develops a life of its own. At least one such group has continued for over a decade with deep bonds of love and fellowship between its members.